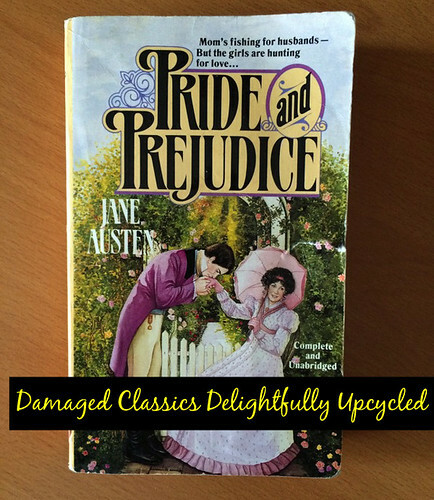 Trashy, Crafty, & Literary: Upcycling for the Win! I love recycling and upcycling. This artist on Etsy combines both! "... I love to go to thrift stores, I think mainly because it's such an adventure! Anywho, my Mom and I were at a thrift store when we saw them throwing out hundreds of damaged and outdated books. This made me really sad, there had to be someway to recycled them into something useful and beautiful. My Mom and I grabbed about 50 books and threw then into the back of our truck and headed home. The books sat in a corner of my tiny bedroom for a few months as I finished up finals for my senior year at UCSD. I Admit It, I'm a Fangirl! So super cool, right? I mean, she even sorta writes like me! She even has that penchant for the exclamation point as I do! Visit her Etsy store, check out her pieces, & try and win a FREE bracelet below! 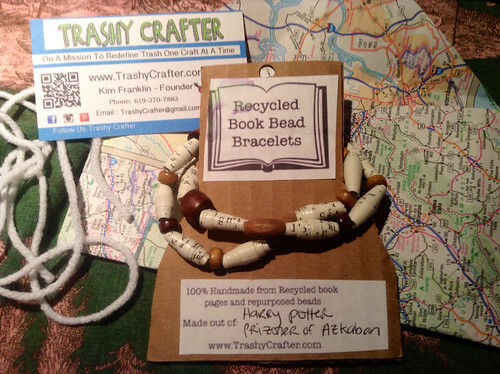 Here's my Harry Potter & the Prisoner of Azkaban bracelet set! I also bought a matching pair of earrings - they're on their way! 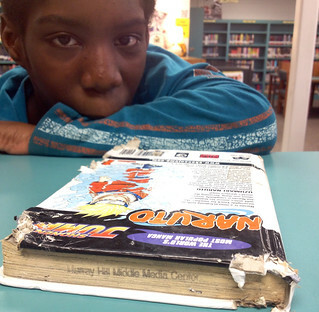 School Library & Classroom Ideas! 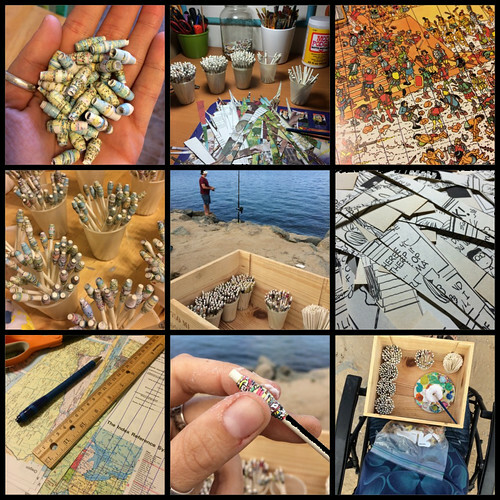 Let's think of ways we can connect to the kiddos about recycling, upcycling and art! Books are precious but they are not sacred. When we weed books or withdraw them because of damage, instead of throwing them away or shipping them off - here are some artsy ideas. 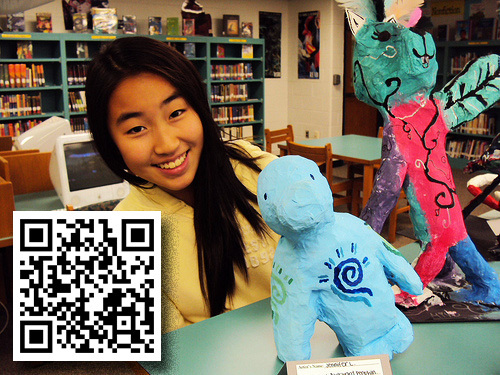 Donate them to the art room and suggest to the art teacher a cool collaborative project! • Literary paper mache of actual letters - that spell words! • Have the kiddos paint in acrylic over book pages that have been gessoed - or watercolour over raw book pages that have been just glued to a board. 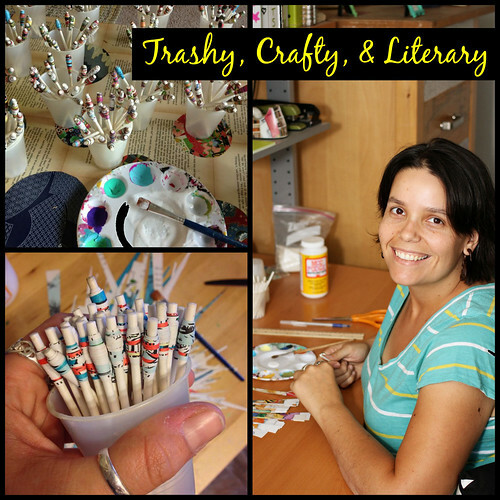 What are your artistic recycling & upcycling ideas? Leave them in the comments also that's how you can enter to win a FREE pair if Trasy Crafter bracelets! 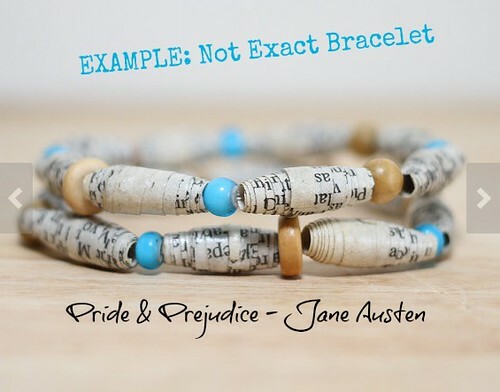 WIN A FREE 2-Piece Bracelet! 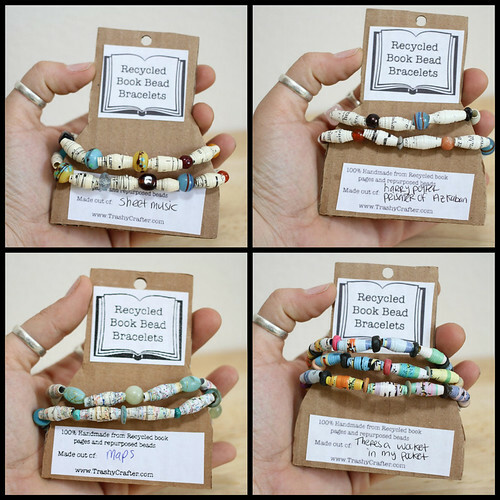 After being in contact with the artist she has generously donated a pair of bracelets for you... my readers as a FUN Giveaway! Please NOTE You Do NOT have to use Facebook to enter this contest - you can use your email. In fact, because I don't do Facebook myself (read why) I would go ahead and use my email addy to enter. But hey, that's me. You be you. I like you the way you are! I just don't want you to see that Facebook thingy below and think, darn, not that again! LOL Good luck! How do you enter to win? Click the widget below for more info! But basically just leave a comment on this blog post as to who one of your most favourite YA authors either contemporary or from your teen years & follow me on Twitter! I'm a Teacher Librarian...I canNOT have just one YA author. I think I would spontaneously combust if I picked just one. But, one of my favorites and go to authors for kids is Laurie Halse Anderson--so much variety and depth in her writing....and then, Chris Cructher....and then Gordon Korman for the guys and gosh, I could keep going. You did say one and I didn't follow directions. again. Thanks Linda for your comment! Because of you I went back and edited my Rafflecopter giveaway description! LOL I know it's hard for us to choose just one! Great authors! Thanks again! YA is just a lovely area for reading. I have found myself reading that when I could read a 'grownup' book. They're just better! Anyway, one of my favorite YA books is Ender's Game. It's had a resurgence due to the movie but I found it as a teen and truly identified with Ender. Hi Melanie! I agree - YA is AWESOME reading! I think after Harry Potter (and the adult covers) mainstream readers have discovered how awesome YA books are! I've never read Ender's Game but because of you - it's on my list! I know picking just one is a Herculean effort for us - but sometimes you gotta just choose! LOL Thanks for your comment Lisa! Does Judy Blume count as YA? I love her so much! Ummmm YES!!! Why wouldn't she be? I've got Judy Blume books in my library! Thanks for your comment sweetie! My favorite always seems to be who I'm reading at the moment and right now I am loving Jason Reynolds. I picked up Boy in the Black Suit at ALA and it's awesome. And he thanked me for being a librarian, nobody ever does that!! I love the upcycling ideas. I just turned a bunch of old, ill-fitting camp t-shirts into tank tops. It was a lot of fun. I think right now Rainbow Rowell is my favorite, but it changes every time I pick up a new book...I also love Neil Gaiman's middle grades/YA stuff. Rick Riordan is a huge favorite. I liked Rick Yancey's The 5th Wave. Also James Dashner's The Maze Runner series. Wendy Higgins' Sweet Trilogy. And especially Kresely Cole's Arcana Chronicles. Just to name a few! I love David Levithan (and thank you for understanding that there are many, many others I love as well!) I have 4 copies of Everyday in my library, and it's one of my favorites to recommend. I'm a little anxious because I let teachers check out over the summer, and I want all 4 of those copies back before schools starts so I can get them into students' hands ASAP! Now? John Green, Sarah Dessen, Laurie Halse Anderson, Jordan Sonnenblick, Gayle Forman, Maggie Stiefvater... Then? I loved Baby-Sitters Club, Sweet Valley High, and all things Christopher Pike. Can't pick just one!